Why use glucosamine in a liquid form? The body does not need to break down a liquid extract, allowing the nutrients to be absorbed directly into our system. Seacoast Natural Foods Liquid Glucosamine (36oz) is a specially designed Glucosamine supplement with added Chondroitin and MSM. This supplement is made for advanced joint support, mobility and comfort. MSM provides an organic source of sulfur. This is key in providing for normal cartilage formation. Meanwhile, Glucosamine helps to keep collagen supple. 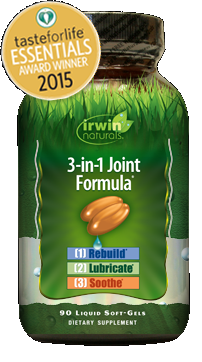 Chondroitin ties it all together by providing lubrication to reduce friction, which helps the joints glide easily. Stay flexible with Seacoast Liquid Glucosamine. Counter aging and stiff, creaky joints- improve joint mobility. Liquid Glucosamine may provide relief from osteo- and rheumatoid arthritis pain, while supplying the body with nutrients required for maintaining healthy, limber connective tissues and joints. Ingredients: 100% Pure Aloe Vera Juice, Purified Water, Glucosamine Hydrochloride, MSM, Chondroitin Sulfate, Natural Lemon & Lime Flavors, Vitamin C, Fructose, Citric Acid, potassium Benzoate (100% natural derived from soy bean), Potassium Sorbate (100% natural derived from soy bean). *Do not take this product if you are allergic to shellfish. I am very active at work and come home with sore and stiff joints in my hands and knees. Since using this product the last 3 weeks I have seen much needed relief. I believe the liquid is a better formula than tablets for me. Easy to measure and take. I do not suffer at all like I used to. I will not be without this product. Thank you Seacoast Vitamins for having this product at a great cost. I have used many glucosamine products for it's effect on joint mobility and stiffness. I find the tablets and capsules upset my stomach. Seacoast Liquid Glucosamine has worked wonders for me and I don't have any side effects. 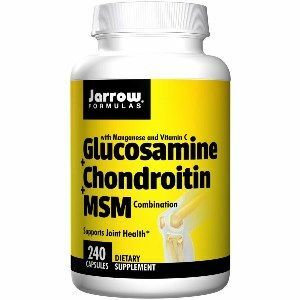 The combination of Chondroitin and MSM make this an effective formula all in one. Great tasting, easy to use and my mobiltiy has increased. I highly recommend this product for anyone currently using tablet or capsule form. The Liquid Glucosamine has helped my knees like you wouldn't believe. I was ready for surgery and now holding off as they are much better. My wife is now taking it also. Everyone knows that liquid Glucosamine reduces inflammation of joints. Seacoast's low price means I can take enough of it to actually allow me to continue working. Thank you Seacoast! for pain in my knees and joints in general. best product I have ever used for this problem I had such severe pain in my knees, I was putting ice packs on all day long. Within 3 days I had stopped wearing the ice packs and was on my way to having the use of my knees again. Did not realize how much it was helping with other joint pain all over my body until I ran out of it. About a week or so later I began to notice aches and pains every where. Got it and again within a day or two was back to feeling great...A wonder product. 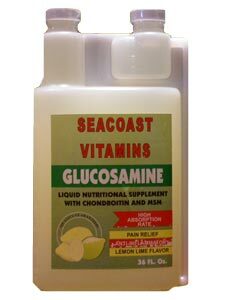 I have been using the Seacoast liquid glucosomine after reading an article that not all glucosomine pills are dissolved after you swollow them. I sewarched the internet and found the Seacoast product. I have been using it for a period of 4 years and it really has helped my arthritis. I am 74 years old and play golf every day weather permitting. I will play 81 - 90 holes of golf a week. My handicap is 14 - 15. I really brlieve that the Seacoast liquid glucosomine helps make this possible. Thank you Seacoast for a really great product. I have been taking Glucosamine and Chondroitin for probably 15 - 16 years and until recently in the pill form. I read an article that said pill form isn't injested completly and therefore was wasted on your system. This atricle also said liquid form was 100% injested and the article also recommended the Seacoast brand as one of the top performers so I gave it a try. I ordered 2 bottles and after finishing the first bottle I realized my arthritus wasn't as painful. As I said trying the Seacoast brand was just dumb luck for me. My wife started usnig the liquid also and dhe also noticed her back felt a lot of relief. The pill form also gave both of us stomach aches, not so with Seacoast. Ireally feel this was a Godsend for both of us. I am 73 years old and lead a very actice life. I play golf (18 holes) every day weather permitting and come home pain free from the golf course. Thankyou Seacoast for a wonderful product the really brings relief. One more word on the Seacuast liquid glucosamine. Price wise it is really a bargain, check out the other brands of liquid glucosamine and you will see what I mean. A great product for the money. Thanks again Seacoast. Works much quicker and more effectively than other pill formulas I've tried. Still playing golf all thsat I can (weather permitting) feel better than ever thanks to the liquid glucosamine from Seacoast, a really great product. I think I will try their multivitamins now that I see how good their products are. I have been on the pill form of glucosamine and chondroitin for approximately 10 years, I am 72 years old and this last winter I started drinking green tea as it was supposed to help my health overall. What a joke, all of the sudden I was having joint pain in my knees and hands as if I had never used any form of supplement, I don't know if it was the green tea or what but I really feel as if it washed awayall the years of supplement use along with the toxins. I work full time and play 63 - 81 holes of golf every week weather permitting and was really concerned that my golfing days were behind me. I ran across a Seacoast add for the liquid supplement and read that the absorbtion rate was so much greater than from pills. I ordered a 36 oz bottle and started taking 1.5 oz a day. After about half way through the bottle I could start to feel relief, what a day that was. I ordered 2 more 36 oz bottles and just finished my first bottle an am really looking forward to warm weather to play golf. My wife is has also started using my supplement as she has arthritus in her back and the pill form upset her stomach and the liquid form does not. Keep up the good work as you have a great product and will recommend it to anyone who has arthritus. Your liquid glucosamine product really did the trick for me. I have been taking the pill form for 7 - 8 years and read an article that most times the are digested before they are 100% absorbed into your system. Well I ordered a 36 oz. bottle and have been using it since it arrived. My knees haven't felt this good in years, I am 72 years old and play at least 9 holes of golf (weather permitting) every day and 18 on weekends. I have a golf cart and pull cart and I haven't used the pull cart in a long time but now I am reeady to try it again as soon as the weather warms up my knees feel that good. Thankyou Seacoast for a wonderful product, it has made my knees feel as though they are at least 20 years younger than the rest of my body! My husband and I both use Liquid Glucosamine for our Arthritic pain and both feel that it gives us relief. We would not be without it.